From Beijing and the Great Wall of China to Emei Shan and a boat ride on the Yangtze through the Three Gorges, this three week holiday uncovers China’s essential highlights to allow small groups to have an authentic experience without feeling like they’re being whisked from one site to the next. Four days in Beijing is more than enough time to explore at your own pace prior to a super speedy bullet train ride to Shanghai which opens up life on the Bund before you head east by overnight train to meet the Terracotta Warriors of Xi’an. After a couple of days hiking around Emei Shan you’ll be transported back in time along the Yangtze River en-route to Liuzhou and Yangshuo, where limestone karsts and bike rides form your days, before you reach your final destination, Hong Kong, from where you’ll prepare to fly home the next day. 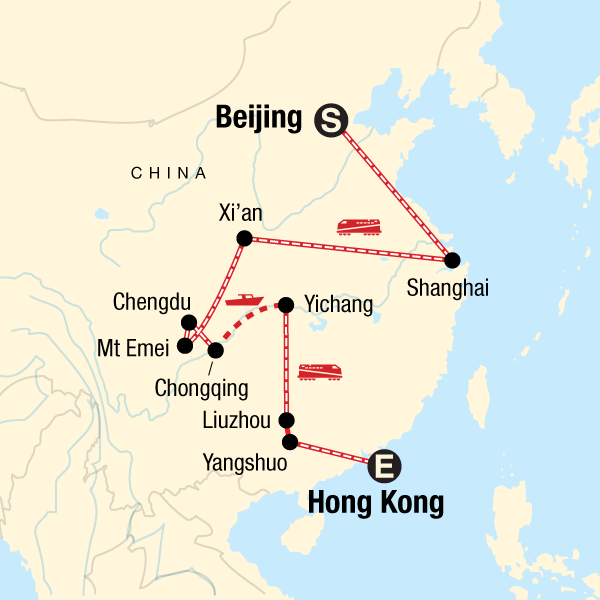 Low Impact Transportation: This trip gives you the chance to try out the public buses, overnight sleeper trains to go from Beijing to Shanghai to Xi’an and from Wuhan to Guilin to Hong Kong, the famous rickshaws and a traditional Chinese-style boat travelling along the Yangzi through the Three Gorges. Getting around as the locals do not only allows you to experience the culture on a deeper level, but the same way it is at home, using public transport is the most sustainable way to go – after walking and cycling of course! Supporting local culture and businesses: There are a multitude of opportunities to support local businesses and immerse yourself in Chinese culture on this trip. From the colourful markets to the bustling food stalls and cafes, the choices for eating and handicrafts are endless and the money is staying in the local economy - a vital way for tourism to make a positive impact. Activities that take you to markets, locally-owned restaurants, locals’ homes and villages are vital to the local peoples’ ability to truly benefit from tourism. Our style of trip, travelling, eating and staying with the locals, puts you right at the heart Chinese culture. China’s multi-ethnicity is evident in the Muslim Quarter. In Xi’an you can visit one of the oldest and best-preserved mosques in China. This is probably one of the few mosques in the world that incorporates a mixed architecture of traditional Muslim and Chinese styles. See the famous Giant Pandas up close and explore Emei Shan, one of the Four Sacred Buddhist Mountains in China. Staying in a monastery. It may not be apparent that learning about and respecting other cultures is part of being a responsible traveler, but we believe that this discovery is a natural way for people of all backgrounds, nationalities, and religions to interact and learn from each other, fostering peace and understanding. And it’s just plain fascinating!